Made in the USA. The Cosmetics faithfully follow the Original 1965 Blackface Pre-CBS Amp. Obviously the Internals are a LOT different, Gone is the Eyelet-Board construction, replaced with a PCB. The Amp is 100% Valve design with a Valve Rectifier. The Reverb is all Valve driven using an Accutronics Long Tank. It is an Expensive 15 Watt Amp because you are paying for the Name. The Stock Unit has a Few 'Issues' but as soon as you plug your Guitar in - You know it's a Fender. My modifications 'Enhance' the performance of an already good Amp. If you own a PRRI, you will recognise some of the 'Issues' that need attention. 1. - At Higher Volumes the Stock Amp produces WAY too much 'Bass' for the fitted 10" Speaker - It 'Pharts' out and does not sound good. A simple component change in the Preamp sorts this problem out. 2. - GAIN Switch - This gives a 50% increase in Preamp Gain with a Slight reduction of Reverb. 3. 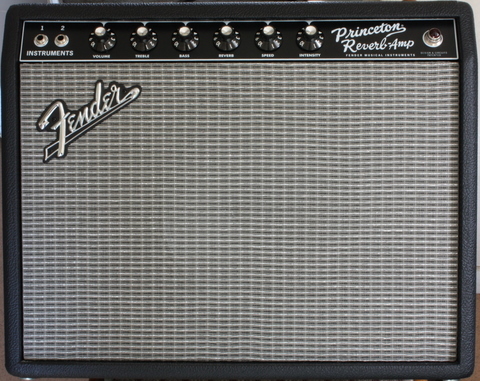 - All Fender Amps supplied in the UK have their Mains Voltage set at 230vac. I reset this to the correct UK Voltage of 240vac. This reduces the excessive 'Heater' voltage and lets the Amp run cooler. 4. - I do 2 Modifications to the Power Supply - Increase the Smoothing Capacity for 'Tighter Bass' -and- fit a 'Safety' resistor so that the Amp can not hold a Lethal Charge when switched Off. 5. - All of the 'Tone' Capacitors in the Amp are Replaced with 'Orange Drop' Parts. This Increases Definition and brings the sound closer to the Original 1965 Amp. 6. - Full Lead Dress - All 'AC' Voltage (Transformer + Heater) wires in a Valve Amp must be tightly twisted or they will Induce 'Noise' into the Amp Circuit. Taking the time to twist all of the wires and placing them in the correct location will make this Amp Quieter (Less Background Noise - Buzz-Hum-Hiss). 7. - I have Modified quite a few of these PRRI Amps and almost without exception the Factory Fitted '6V6GT' Power Valves are Faulty -or- Rapidly Fail under Load. I replace these 2 Valves with JJ '6V6S's then test the Amp under full load to confirm correct operation. 9. - Optional Upgrade - Variable Boost Footswitch - Switches the Internal Boost (Tone Bypass) Circuit On-or-Off. The Footswitch is fitted with a Variable Boost Level Control (From Zero -to- Max) and gives a Huge 'Boost' to the MID Frequencies and Harmonics. Connects to the Back of the Amp next to the 'Reverb/Vibrato' footswitch socket. With the Variable Boost Footswitch 'On', the Tone Controls (Treble and Bass) are Bypassed. Metal Case, 12 foot lead, Red LED (On) Indicator. 10. - Optional Upgrade - NFB Switch - (Negative Feedback On-or-Off) - Almost all Fender Amps use 'NFB'. This is an Internal Loop that sends part of the Speaker Signal 'Back' to a Previous stage in the Amplifier Circuit. It helps to keep the Amp 'Clean' and allows 'Tone Shaping'. If the 'NFB' is turned Off - the Amp becomes a Lot more Aggressive and Harmonic. 11. - Optional Upgrade - The Stock Amp is Rated at 15 Watts RMS. With a Few component changes the Amp can produce Approx.18 Watts RMS with NO Harmful side effects. 12. - Optional Upgrade - The Amp can be fitted with a 'Half Power' Switch. This will allow you to get the High Power 'Harmonic Distortion' Sounds at a much lower Volume. To avoid drilling the Metal Chassis, the New Switch replaces the Fuse Holder on the Rear panel of the Amp. The Fuse Holder is then located inside the Amp Chassis. 13. - Optional Upgrade - The 10" Speaker can be replaced with a 12" unit. I recommend a Jensen C12N but you can request any Speaker you like. There is a fair amount of work involved with this Mod - The Front Speaker Baffle must be removed from the Amp, then the Grille Cloth removed, the Speaker Hole enlarged, New Mounting Bolts Fitted, Baffle Re-Painted Matt Black, Grille Cloth Refitted, Baffle Refitted to the Amp and the New Speaker fitted. The Amp performs MUCH better with a 12" Speaker. 14. - Optional Upgrade - Dual Rectifier - The Standard Amp uses a Valve Rectifier. A Switch can be fitted so you can select 'Valve' -or- 'Silicon' Rectifier. The Valve Rectifier is Great for SAG but reduces the possible output of the Amp by several Watts. Using the 'Silicon' Rectifier will increase Clean Headroom. Amp output will be 20 Watts RMS. There is one other (well documented) Issue with these Amps. At Lower Volumes, No Problem, but if the Amp is used at High Volumes the Upper-Rear 'Kick' Panel vibrates (Rattles) in sympathy with the Speaker. I have seen loads of 'Cures' for this problem on the Internet, including Metal Bracing and a Thicker Panel. The Simple cure is to remove the Panel from the Amp, if you need to.